There was a time not so long ago when winning a league road game in November was enough to make me declare the season a success. After Michigan's struggles on the road this season, this was a very nice way to spend Saturday afternoon. • How can you not be impressed with what Devin Gardner showed you on Saturday? Say what you will about how good or bad Minnesota's pass defense is (it's actually not that bad), no matter when you have a backup quarterback come into the game, you can only hope for a performance like Gardner's. 12 of 18 for 234 yards, 2 touchdowns and 1 interception. He also ran the ball 10 times for 21 yards and another touchdown. But what the box score won't tell you, and what you could only see if you watched the game, is that Devin Gardner looked poised and confident. Even after the rocky start and the ugly interception, he regained his composure and controlled the rest of that football game. It was great to see Devin perform so well when he needed to the most. The QB situation going forward is much brighter than it was a week ago...with or without Denard. I made the mistake late in the game on Saturday when I posed the question on Twitter whether Michigan now had a QB controversy. Let me clarify that I don't think Devin should be the starter if Denard is healthy enough to play. I love the way Devin played, but I think Denard brings a whole different threat to the game that defenses have trouble adjusting to. It's easier to defend a good passer than it is to defend a decent passer who can torch you with his legs. But it feels really good to know Michigan has both. • For as much as Devin looked good on Saturday, his offensive line did not. Gardner was rushed a lot, and the line didn't do it's job very well. But pass blitzes aside, even on running plays against an even man front, a few members of the line had a really tough time...namely Elliott Mealer and Ricky Barnum. On Twitter, throughout the game, folks were blasting Al Borges for his play-calling. Frankly, I wasn't seeing it. I thought the play-calling was fine. It all came down to the line not executing. Pass plays got blown up by unblocked blitzes, run plays got shut down by our interior just being out-played. And it wasn't all the line, Fitz missed a couple blitz pickups as well. It was embarrassing. This unit needs to regroup and get it together or the next 3 weeks won't go so well. • Not to be over-shadowed by Devin or the O-line...the defense played another outstanding football game. Minnesota isn't all that great, but holding a team to 147 yards passing and 275 total is still an accomplishment. The Gophers were only 4 for 14 on 3rd down. As it stands right now, Michigan ranks #1 in pass defense and #7 in overall defense in the country. 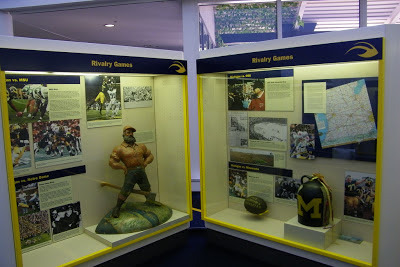 What a great job being done by Greg Mattison and his crew. If nothing else, Michigan is going to be known for dominating defense again, I can tell you that. They're for real...and they're only going to be getting better and more experienced. • Brendan Gibbons picked a perfect time to shank an extra point on Saturday. Minnesota was lined up in the neutral zone, thus giving the Michigan legend in-the-making another shot at keeping his PAT perfect streak going at 30 for 30. • Finally, the Jug remains at it's rightful spot next to Paul Bunyan inside the friendly confines of Fort Schembechler.